As a former World Champion in sailing Hein knows how to be one with the water and the wind. He has experienced ‘Presence’ as a sailor where he ‘knew’ what the wind and the other competitors were going to do. But how would that be in the desert; alone, without food? 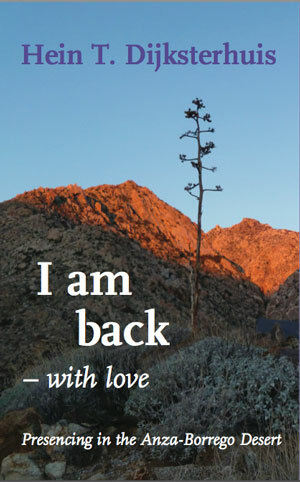 He registers for a vision quest in the Anza Borrego Desert in Southern California: small group, 12 days in the wilderness, four days of fasting and three days of solo. He journals about his experiences during the quest in a personal, authentic and funny way. His unique style of story telling stimulates the reader to dive into his own core questions in life. I put aside the many books on my bedside table and read yours. It is wonderful. I thoroughly enjoyed reading your story and watching you unfold before my very eyes. Reading your story helped me see my own story. So, thank you so much for being a faithful guide–telling your story so openly and simply. I’m really glad you wrote it, and very appreciative of you sharing it with all of us in Berlin. How do I buy a few more? Once more I wish to thank you for the inspiring and illuminating words of your book. You write with brave honesty and captivating humor about your experience and in doing so touch universal sentiments we can all share and learn from. I just finished the book yesterday and enjoyed it very much. Secondly, I want to say how much I learned from and appreciated your presence in the Master Class. You always struck me as one who has his feet firmly on the ground with solid experience of human frailty and life’s challenges yet was one who has kept high ideals up front in a very human and courageous way. I thank you for that. Your clients are fortunate to have you guide them. I wish you well in your work and happy times with your family these summer months. When I was a boy I used to sail with an uncle, but never kept it up…maybe you can offer learning journeys at sea for some of us old timers of the master class!! Your book accompanied my journey from Berlin to Shanghai. I did not feel I was on a journey of flight but a journey of yours which you shared vividly in the book. I felt I was there and understood everything you wrote. I may not comprehend the depth but I saw you and felt myself. It helped me retrieved the feeling I had during the solo in cape cod. Hartelijk dank voor je boek. Mooi dat je je gedachten en vooral ook je dromen op deze manier deelt, heel fijn en inspirerend om van een individuele presencing ervaring te mogen mee genieten J , lezend in een comfortabele stoel. Afgelopen weekend je boek in twee keer uitgelezen! Dat is toch echt heel bijzonder zeg, dat effect. Jouw ervaringen zitten dan inene onder mijn huid, alsof ik erbij ben geweest. Finished book, great read! I really enjoyed your book. I liked your succinctness. Heb deze week met veel plezier je boek gelezen en veel herkend! Wat moedig dat je dat aan gegaan bent en ook dat je dat zo open durft te delen. Maar ja….”is niet het meest intieme, het meest universele? “ Je zult er velen mee raken!